Birding Is Fun! : Thank You Mr. Flame! No, I'm not talking about Richard Simmons. I'm referring to the famous male Flame-colored Tanager of the Santa Rita Mountains in Southeast Arizona. He was first discovered in May of 2003 at the Madera Kubo B&B in Madera Canyon. A few weeks later a female was also found. In the summer of 2004 the pair successfully fledged two young. They became only the second pure flame-colored nesting pair known in Arizona. 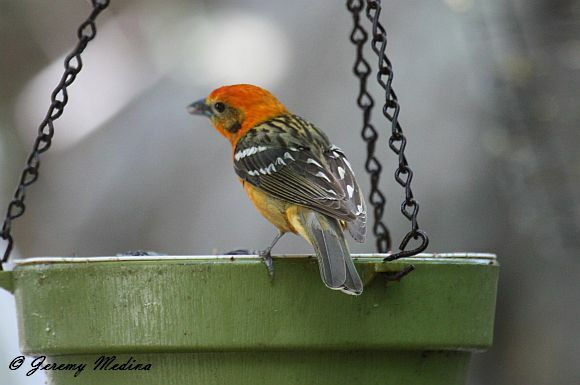 Flame-colored Tanager identification can be problematic in Arizona because they have been known to hybridize with Western Tanagers. In fact, a few years later, Mr. Flame paired with a female Western Tanager and was reported at the nest with young. After all, what female could resist his fiery hot bod? His pale orange back with dark streaking and bright orange head and body (not yellowish or reddish) make him a pure individual of the west Mexican subspecies, bidentata, the expected one in Southeast Arizona. Males of the eastern Mexico and Central American group (sanguinolenta) show more red in the head and underparts. He returned to Madera Canyon each spring for eight consecutive years! I was fortunate enough to have seen him during three of those years. He could be heard singing loudly from the treetops or seen enjoying the fresh oranges and grape jelly put out by the owners of the B&B. Of course, we don't know for sure that this was the same individual year after year. Unfortunately, we do know that he was not seen or heard during the spring/summer of 2011. Every spring the Madera Kubo B&B has lots of eye-candy for birders to enjoy. From stunning Scott's Orioles to flashy south of the border hummingbirds. But I haven't seen any bird there as special as Mr. Flame. No field guide could ever do him justice. Just look at him, he's spectacular! 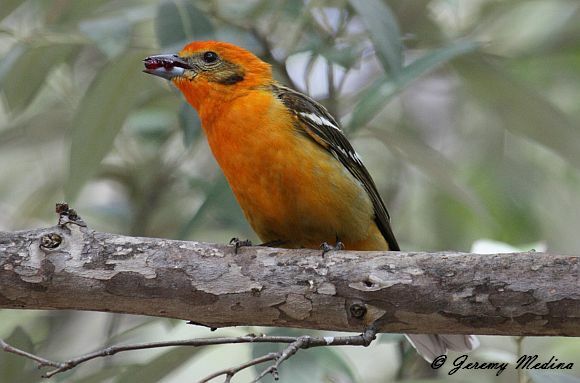 Flame-colored Tanagers have also been recorded in the Chiricahua and Huachuca Mountains of Southeast Arizona as well as west and south Texas. They are residents of western Panama to northern Mexico. Mr. Flame no doubt has captivated many birders in his lifetime from all across the globe. I'm curious how many of our readers were lucky enough to have seen him. If you've had the privilege, please leave a comment with the month and year. Or if you've seen this beautiful species somewhere else, tell us that too! I want to thank Robert for inviting me to join his awesome team at Birding is Fun! You can read my posts here every 13th of the month and many more on my blog- AZ Birdbrain. What a beauty! How lucky you were to be able to observe them during their brief visit to the states. Perhaps a pair will find their way back one day. very nice post and gorgeous bird. Wow, gorgeous bird! How fortunate you were to observe such a beautiful bird. My fingers are crossed that you will catch sight of these lovely birds in the future. Fantastic! Ha, good choice for a blog post. I have seen him 3 different years as well, and hope to run into him again. Did you take these pictures? They are fabulous! @Judy E.-Yes, I took these photos. I was a bird phobic. Thanks for helping me past my fears by providing me with such amazing pictures. Beautiful Bird! Thanks Jeremy! Lovely bird Jeremy! Hope you get to see them again. Wonderful post Jeremy! What a great bird and information. I love the map too.